With our impending 10 day boat journey to Antarctica with Quark expeditions edging ever closer, we decided we needed to get some sea leg training in beforehand! Prior to this adventure, our boat experience amounted to a cruise in Halong Bay, so it seemed wise to have a practice run before we headed to Antarctica! 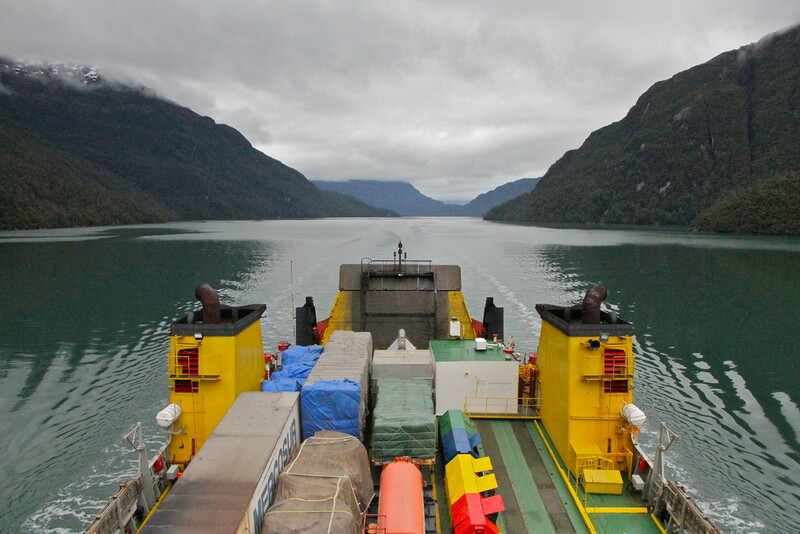 Before arriving in Chile, we’d heard about a cargo ship which also took passengers through the Chilean fjords. It would take four days, offered basic accommodation and service, but would also provide the best views of the Chilean coastline and fjords. Deciding between this or countless long bus journeys to make our way south, we signed up for the cargo ship option and prepared our sea legs for action! 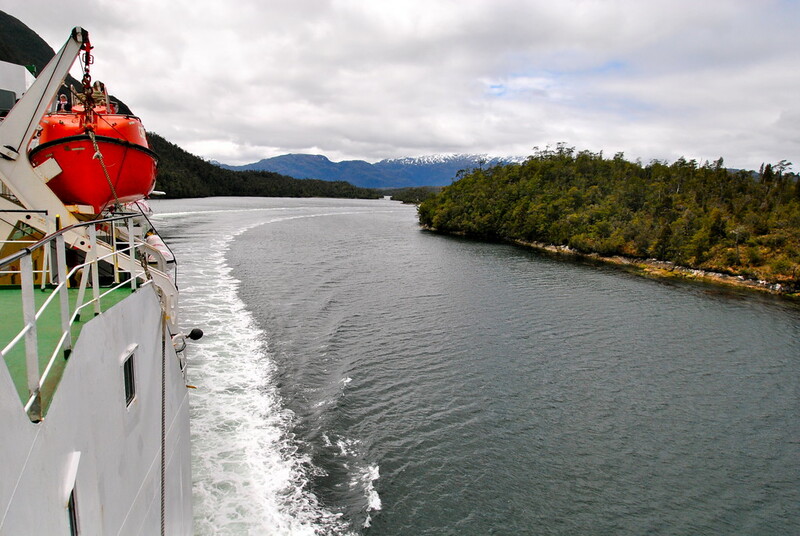 After arriving in Santiago and making our way south to Puerto Montt, we picked up the Navimag ferry for our four day journey south through the Chilean fjords. 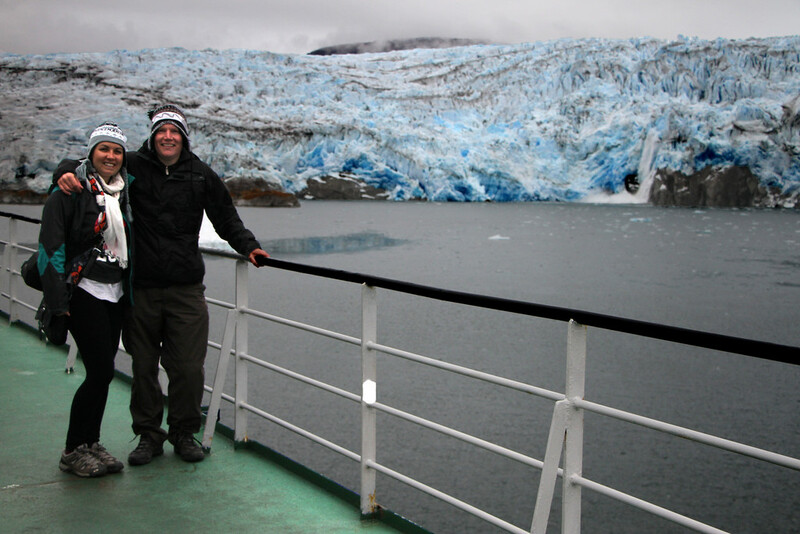 What followed were four days of beautiful scenery, glaciers, whales and storms all of which set us in good stead for our Antarctica trip! 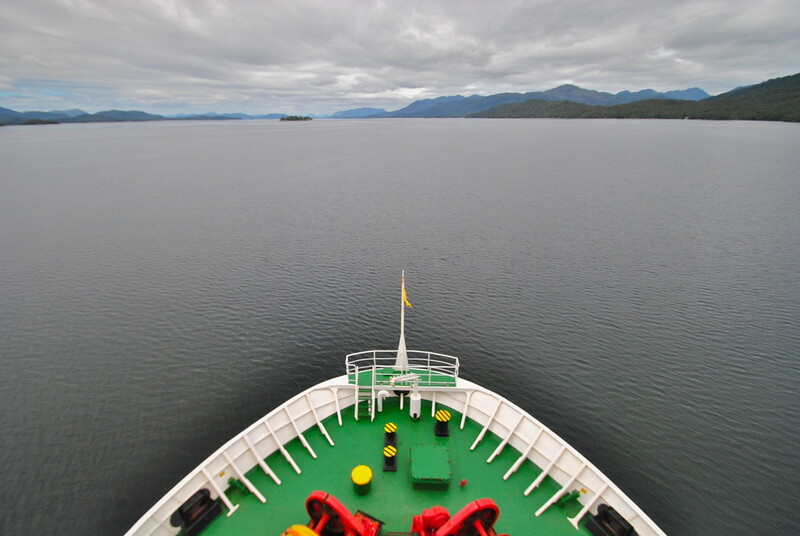 Stepping onto the ship, we navigated the bulbous protruding steel rivets of the ship’s loading area as we ducked between the associated lorries and trucks full of cargo bound for Puerto Natales. In particular an open top truck full of cows caught the eye, well at least we’d be more comfortable than them. We brushed past the cargo area of the ship and made our way up two decks to the main accommodation quarters and sought out our room for the next three nights. The Navimag has a number of accommodation options, and we opted for a 4 bed room. After meeting our friendly and normal roommates (phew), we headed up to the deck to watch the thousands that had congregated at the port to wave us off. Well, the two blokes who had been helping with the loading gave us a wave at least. And we were off! We had no idea what to expect from the next four days, but we were with friends, had plenty of music and books, and the increasingly competitive monopoly deal game. As it turns out, there would be plenty of things to keep us occupied during the journey, especially when Monopoly deal became too intense… The Navimag experience exceeded our expectations: the food was basic but tasty and filled us up, there was plenty of fresh water to drink and they even ran lectures during the day on topics about the fjords including the birds and mammals of Patagonia. There was a well stocked bar with comfortable places to sit and read, and if you fancied braving the cold, there was plenty of beautiful scenery to admire. 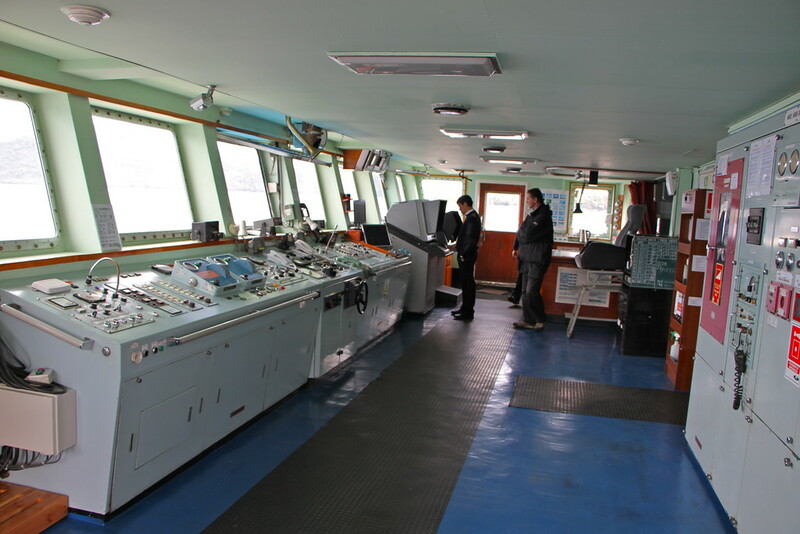 A major bonus was accessibility to the captains deck, where we could watch as the captain relayed orders to his first mate, all the time making minor adjustments to our route. We spent a lot of time on the deck, admiring the view and talking with the crew. It was seriously tempting to press one of the brightly lit buttons or flick a switch, I mean whats the worst that could happen? The deck was always the best place to go whale or dolphin watching, and many a time on our journey there would be an excited announcement from the captains deck: “Ladies and gentlemen, there are two humpback whales alongside us on the starboard side” or our favourite (whilst we were having dinner) “Ladies and gentlemen, there are five dolphins swimming alongside us on the port side”. I never did get the handle of which side was port and starboard, opting instead to wait a second to see which direction everyone else went in and follow them. Most of the time they were right, not always though. 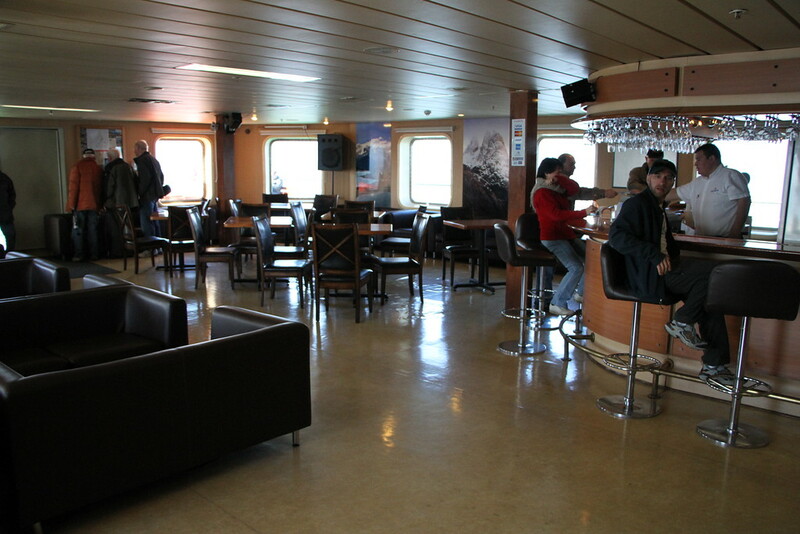 With three meals a day, time on the captains deck, running around the ship to see whales and dolphins and playing cards, you can see how easily the time would ebb away. In the evenings, a documentary would be shown in the dining room, from March of the Penguins to documentaries on Tierra Del Fuego and butterfly migrations. Our only other stop on the journey was to visit Puerto Eden, one of only a few remaining local villages home to indigenous groups in the fjords. It was a beautiful place, with the locals coming to pick us up from the ship in their own boats to take us to the mainland. We had a couple of hours to walk around the area before making our way back to the ship. Puerto Eden was a welcome break from the ship and a lovely place to spend a couple of hours. 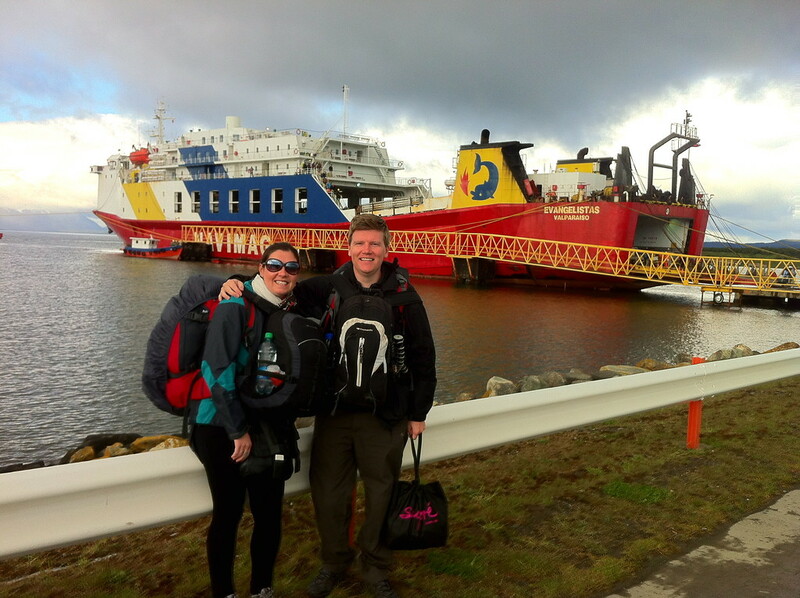 Making it to Puerto Montt in good time, unfortunately we were caught in a storm and couldn’t make it to the port that evening. Another (unexpected) night on the ship then, but another chance to relax in the bar and catch some sleep before our photo bus tour of Torres del Paine and our one day trek in Torres Del Paine! We’d highly recommend the Navimag option if you have time and are heading south through Chile anyway. 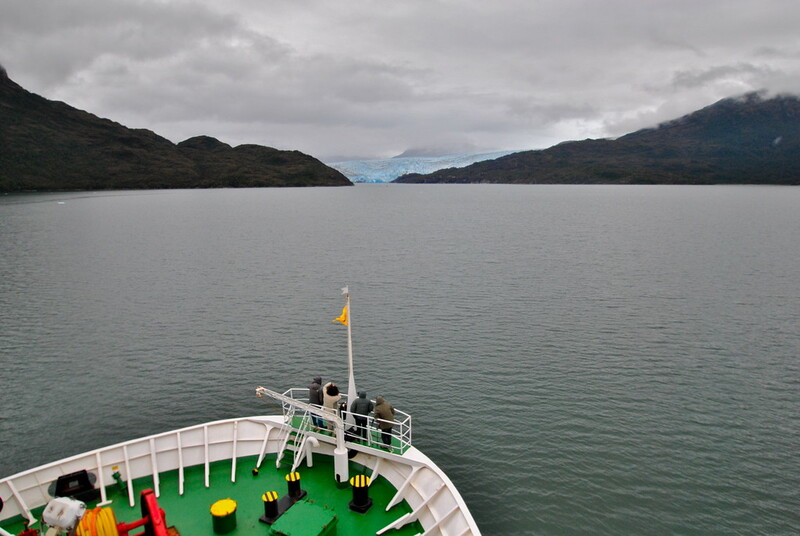 It’s well organised, comfortable and offers fantastic scenery of the Chilean fjords. 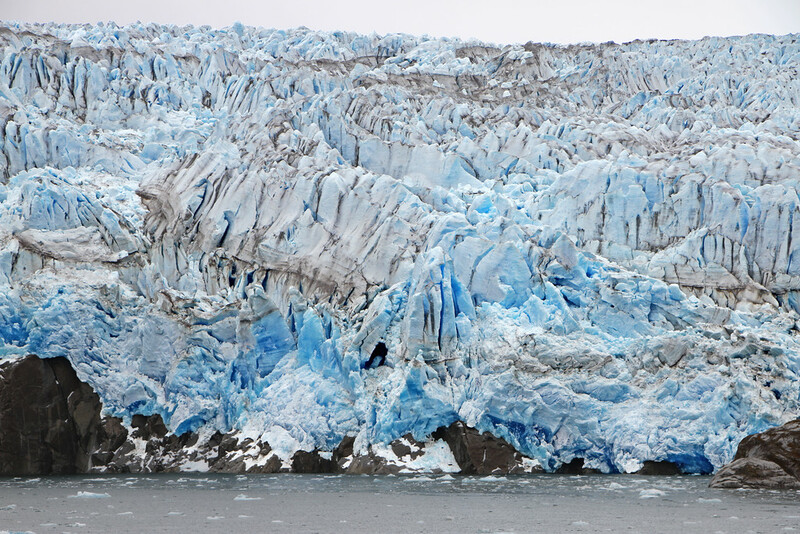 It is not a cruise, but offers a fantastic opportunity to see parts of Chile you would otherwise miss on an overland trip! Looking For Accommodation In Puerto Natales? If you’re looking for some accommodation options in Puerto Natales or elsewhere in Chile, we recommend you check out Agoda. Whenever we’re making plans for a new destination, we always research the accommodation options first to check what’s available. That’s just our travel style. 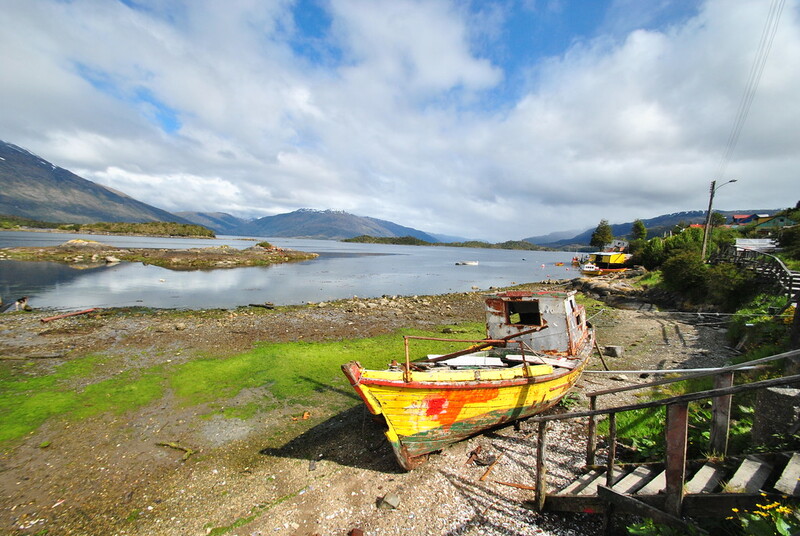 If you want to get some accommodation ideas on Puerto Natales, or anywhere else in Chile, click here! What a fabulous trip you had on this cargo ship. I still love reading all your doing and seeing the photos of where you’ve been and where you’ve stopped and walked around. Thanks for your kind words! We found the Navimag ferry to be very reliable and we felt very safe on it, but we took this journey in 2012 so things may have changed since then! When we took the journey, the majority of the sleeping accommodation was along corridors with a curtain for privacy. You can pay more for a four berth room and private rooms so it all depends on how much you want to spend on it! For us it was a great solution to avoid some long bus journeys overland!